Back to Home Page Curriculum Personal Achievements. Research Interests I am currently writing a PhD Thesis. PC Programs I wrote for my PC. Spectrum Published programs I wrote for my Spectrum Electronics Electronic Circuits I designed and built. Personal Bookmarks VRML Model of my face! Mosaic techniques have been used to obtain images with a large field of view from video sequences by assembling individual overlapping images. In existing methods of mosaic construction only consecutive frames are aligned. Accumulation of small alignment errors occur, and in the case of the image path returning to a previous position in the mosaic (looping path), a significant mismatch between non-consecutive frames will result. A new method for ensuring the consistency of the positions of all images in a mosaic is described. My PhD project is concerned with graphic modelling techniques for virtual reality applications. The increasing realism of computer generated graphics in Virtual Reality applications such as special effects for films, video games, virtual museums, etc. requires a number of qualified professionals to perform the laborious task of building the graphic environments. This project aims to investigate the capabilities of video for scanning and modelling of environments for Virtual Reality applications. When scanning becomes an easy and inexpensive task available to the user there will be a revolution similar to the invention of photography, in which painters were no longer needed to represent the reality in a picture. Video is a low resolution medium that compares poorly with computer displays and scanned images. It also suffers from a limited field of view. Large objects can not be captured in a single picture. Using wide angle lenses introduces substantial distortion and mapping an entire scene into the limited resolution of a video camera compromises the quality of the image. Mosaicing from video images is a solution, offering wide field of view and high resolution. 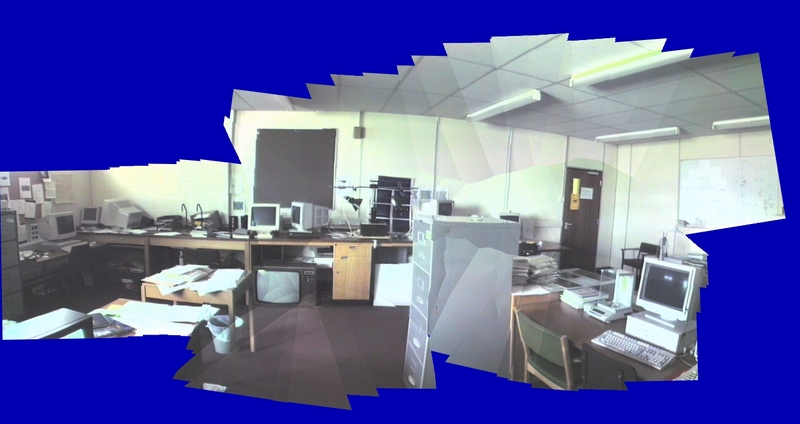 The construction of panoramic mosaics from video begins with the alignment of successive frames of a video sequence. The images can be integrated in a single large picture as the camera pans from left to right. The colours represent different images. In this sequence the camera never sweeps back. This type of panoramic mosaic can be easily composed using commercially available software. Although good alignment is achieved between successive images, cumulative errors cause poor alignment when the image path follows a loop, i.e. when the same area of the scene is covered by images which are distant in the sequence. Sequence showing a looping path. This type of mosaic cannot be composed correctly by any commercial software. 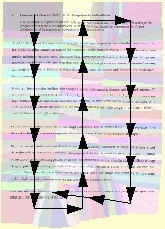 The effects of the looping path problem are dramatic when large numbers of images are involved in the loop. In addition, the misalignment is unavoidable even when the frame-to-frame displacement has been computed very accurately. Note the misplacement of the images at the intersection of the path. For the rigid model, a translation (dx, dy) and a rotation angle dq of image j with respect to image i, correctly describe their relative position. The relative position of a neighbour pair of images will be modified slightly without introducing a visible loss in quality. Such a change from the computed position must not exceed a fraction of a pixel if the seam is to remain unnoticeable. The solution uses an analogy with a physical model, consisting of a network of connected nodes representing the centres of the images on which forces are exerted in order to change their position. The links between nodes are defined by the transformations that align neighbour images. In this analogy f (Dij) represents the force pushing image i towards the right position with respect to image j, where the function f models the force. Relation between the positions of the images in the mosaic P0, P1, P2, P3, P4 and the relative positions t01, t12, t23, t34 that align successive images. D04 is the error between the computed relative position of images 0 and 4 ( t04 ) and their actual relative position in the mosaic (P4 - P0). The circles represent the centres of the images. The performance of the function f (Dij) is assessed by inspection of the overall distortion E and the error for the worst case Emax once equilibrium is achieved. The function that gives the minimum error and the fastest convergence was found to be proportional to the square of Dij. 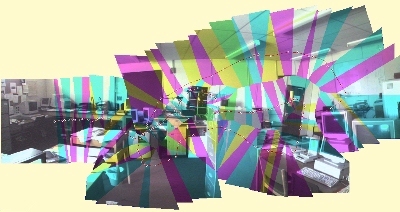 At the end of the process the cumulative error is spread across all images, and therefore no single pair of images shows a marked misalignment. The technique for solving the looping path problem has been tested with various sets of images resulting in excellent overall improvement of the mosaic. 1663x2320 pixels mosaic, composed of 141 images (736x560 pixels). The colours represent the areas used from different images. The path followed by the camera is superimposed. Alignment on consecutive frames only showing misalignment due to looping path problem. Alignment after error distribution showing images in correct positions. Table 1: Document Mosaic, 141 images, 354 pairs of neighbour images. The table shows the errors present after readjustment. In the worst case the images have been displaced by about half a pixel from their computed position. The 130 images in this mosaic were obtained with a hand held video camera from a fixed location. Note the improvement with respect to the alignment on consecutive images only, shown above. 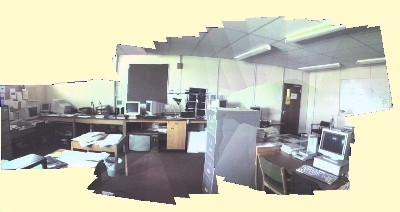 Table 2: Mosaic ‘Lab’, 130 images, 302 pairs of neighbour images. The errors are higher than in the other mosaics due to errors in the computation of image alignment caused by parallax. In addition, the field of view is about 90°, so further distortions are introduced by the mapping onto a plane. It has been shown that a new step must be introduced in video mosaic construction to account for the looping path problem. 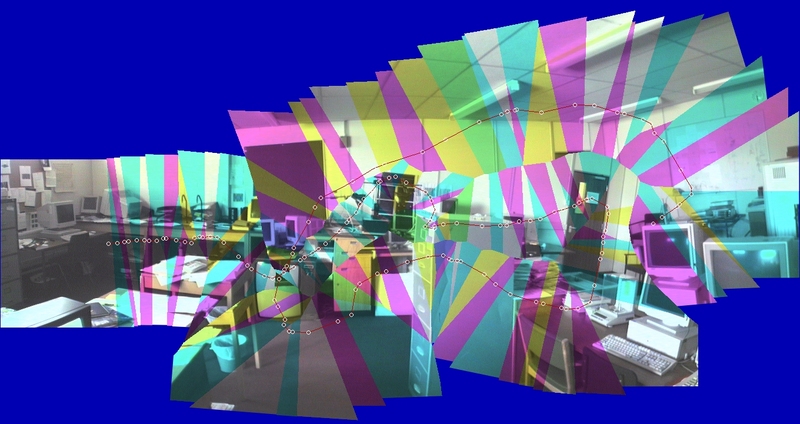 Cumulative errors occur in successive image alignment, and in the case of the image path returning to a previous position in the mosaic, a significant mismatch between non-successive images will result. The proposed solution makes use of the alignments between all neighbour images to consistently position the images on the mosaic. Starting with the successive image alignment positions, these are modified by small increments to reduce the overall misalignment error. Since the field of view is not a limitation when using this approach, 360° mosaics can now be produced. Current research aims at full spherical mosaics for applications in Virtual Reality. Considering the projective transformation matrix as a representation of the position and orientation of a camera in space, an analogous method using forces can be used for the consistent alignment of all images in the mosaic using the projective model. Paul R. Wolf, "Elements of photogrammetry (with air photo interpretation and remote sensing)". - New York; London : McGraw-Hill, 1974. R. Szeliski, "Video Mosaics for Virtual Environments", IEEE Workshop on Applications of Computer Vision, pp. 44-53, 1994. S. Mann and R. W. Picard, "Virtual Bellows: constructing high quality stills from video", IEEE International Conference on Image Procesing, pp. 363-367, 1994. H. S. Sawhney, R. Kumar, "True Multi-Image Alignment And Its Application To Mosaicing And Lens Distortion Correction", Proceedings of the IEEE Computer Society Conference on Computer Vision and Pattern Recognition, pp. 450-456, 1997. 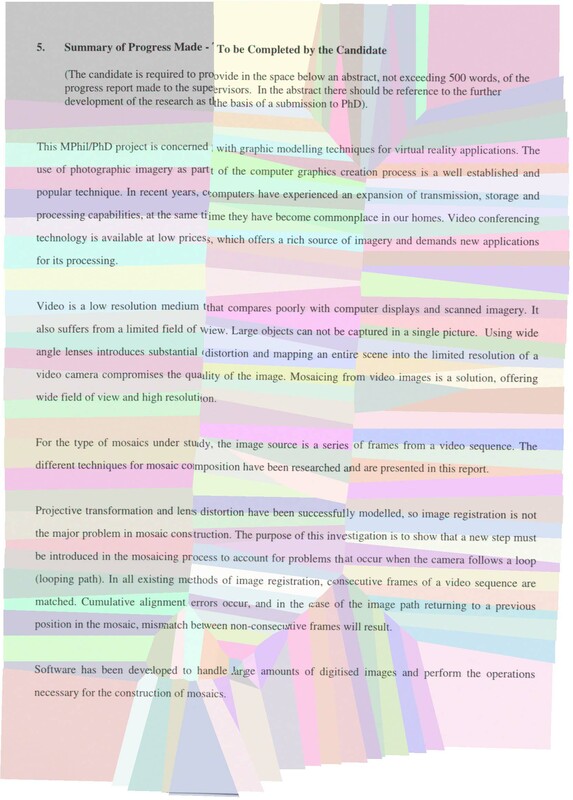 P. J. Burt, M. Hansen, P. Anandan, "Video Mosaic Displays", Proceedings of SPIE - International Society for Optical Engineering, Vol. 2736, pp.119-127, 1996. R. Szeliski, "Image Mosaicing for Tele-Reality Applications", Cambridge Research Laboratory, Technical Report Series, May 1994. S. Peleg and J. Herman, "Panoramic mosaics by manifold projection", IEEE Conference on Computer Vision and Pattern Recognition, pp. 338-343, San Juan, Puerto Rico, June 1997. Rik D. T. Janssen and A. M. Vossepoel, "Compilation Of Mosaics From Separately Scanned Line Drawings", IEEE Workshop on Applications of Computer Vision - Proceedings, pp. 36-43, 1994. A. Zappala, A. Gee, M. Taylor, "Document Mosaicing", Proceedings of the British Machine Vision Conference, Vol. 2, pp. 600-609, 1997. M. Hansen, P. Anandan, K. Dana, G. van der Wal, P. Burt, "Real-time Scene Stabilization and Mosaic Construction", IEEE Workshop on Applications of Computer Vision - Proceedings, pp.54-62, 1994. F. Aurenhammer, "Voronoi diagrams: A survey of a fundamental geometric data structure", ACM Comp. Surv., 23:345-405, 1991. M. Irani, P. Anandan, S. Hsu, "Mosaic Based Representations of Video Sequences and Their Applications", IEEE International Conference on Computer Vision, pp. 605-611, 1995.